Like us, your Betta Fish can be psychologically effected by their environment and home, which can have both a positive or negative effect on your little friends stress levels and well being. Having a healthy and stable home environment for your fish is essential to keeping them happy and healthy. By somewhere to play, rest and hide can help lift your fish’s mood thus making them more active. Though some plants can be toxic if eaten, Betta Fish are carnivores and will only nip at the plants to test them or may even eat the roots if they are feeling sick due to things like high ammonia levels in the water or other diseases. To read more about Betta Fish diseases see our complete guide on Complete Guide to Betta Fish Diseases and Treatment. From minimalistic to lush forest, only your imagination can limit how you design your Betta Fish’s home. Their natural environment is found in the rice fields of china. So having tall grasses or stem plants to swim around helps to put them at ease. A nice broad leaf can be used to hide under or even rest on top of. 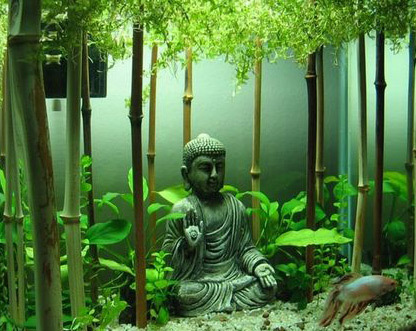 Or even a nice little floating plant can offer shade, shelter and security for your fish. Live plants have many benefits over synthetic or silk plants. This is more notable with the effects on the tank environment. A live plant not only grows and change as time goes by. They also help to filter and condition the water by absorbing harmful waste like the ammonia and nitrites caused by fish waste and other factors such as uneaten food. Live plants can help to keep the PH levels in check. See our article All About Water for PH level testing. Temperature – The ideal water temperature for both the plants and your Betta Fish is between 75-80 F.
Lighting – Too much light is likely to grow mostly algae, while not enough wouldn’t allow for much plant growth. Direct sunlight (by a window) can cause the tank to over heat during the day with the nights being much colder. Incandescent – may cause the tank to over heat quite easily. Fluorescent – can not be left running for more than 8-12 hours pending on the size of the tank. LED – white, blue and red are needed for plant growth. Most LEDs come as a combination light of all three. How ever you may want to confirm this option prior purchasing a light and not take it for granted. The Blue light can also be used to active the neon effects of some decorative items at night. Live plants though able to feed off fish waste will still need additional nutrients and food to keep them healthy and strong. You will need to use the option that best suits your tank setup. If you are looking for a more artistic decorative feel. This form of presentation is widely used for interior decorating. The biggest draw back to this method is that the smaller amount of water will require more involved maintenance with 20-30% water changes everyday, and the need to use a water conditioner every 24-48 hours. Some plant cutting though tempting to use could in fact be toxic for your Betta Fish. An option around this would be to use a vase with a central core that would keep the plant separate from the water for your Betta Fish. Not all submerged plants can be kept in small tanks. Some will require trimming while others will be unable to be cut back. Other plants will not be suitable for gravel bases instead requiring and anchor to attach to like a rock or decoration piece. Consideration will be needed when picking the plant(s) that best suit your Betta Fish’s home. As a general guide a 2 gallon tank would suit one small plant. Any more than that and you run the risk of crowding your Betta Fish and there may not be enough nutrients in the water to sustain more plants. A broad leaf plant that grows from a cluster of stems. Need to be embedded to grow. A low-maintenance, requiring medium lighting and fertilized. Like the Amazon Sword with a more vibrant color. A low-maintence plant that likes the tank as clean as your fish would. Anchor to drift wood for best perch, will rot if buried. Requiring low lighting and low fertilizer. Growth and shape highly effected by volume of light exposure. A spinney nettles looking plant that stretches out like fingers. Leave it to float do not embed it. has a large appetite for ammonia. Grows fast but sheds nettle as it dies. Fast growing Nettle plant that sheds. Also clears a lot of ammonia out of the water. If left alone for too long, it can and will overcrowd the tank when it propagates. Can be considered and invasive species. Requires regular trimming as it is a fast grower and if left alone will over crowd the tank. Provides dense foliage for the fish to hide in. Best grown attached to rocks and other decorations. Algea-like plant with mostly slender structures that attach to almost any surface. Ideal for screening the back of the tank. Maintenance would consist of ensuring that plants growing in unwanted areas (around the filtration) are removed. This is a relatively high maintenance plant. Surface plants can offer ideal shade cover for your Betta Fish. Betta Fish like to build bubble nests near the surface and a floating plant would offer them a good spot to build their nest, even if they’re not being bred. The biggest draw back to these sort of plants is that they can spread to cover the entire surface blocking any light from getting through. Best to use a partition, or a floating barrier like a ring to contain these sort of plants and prevent them form taking over the tank. Small green waxy petals that almost look like clover. Often found attached to other plants being purchased. Can be considered an invasive plant. If ignored will take over the tank and with a large appetite they can absorb too much of the availed nutrients. If you are looking for a minimalistic approach. 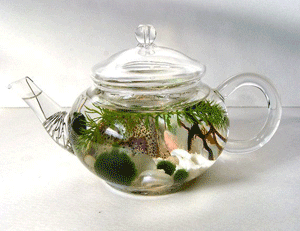 There are manufactured moss products that come in a variety of shapes and sizes for your Betta Fish to play with. The most common item is a moss ball and it can be found here. Using these products allows for you to quickly and easily change out your Betta Fish’s home for a new one with minimum effort and as frequently as you like. In conclusion using live plants not only helps to benefit your Betta Fish’s health and home but also offers a variety of decoration options for your own home. Remember to select the plants that best suits your tank and lifestyle. If you live a busy lifestyle choose a plant that’s low maintenance or invest in a self maintaining system. Betta fish should not be kept in anything smaller then 2.5 gallon tank. 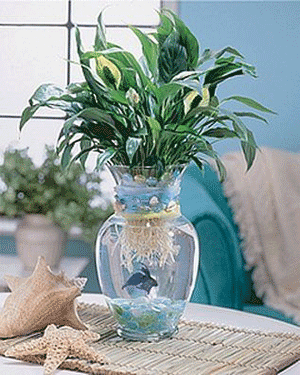 You should never keep a fish ( or any animal) in a vase. Where did could I purchase those bamboo rods? I really like the look of them!